I’ve inherited this trait from my Gran whereby I struggle to cook small portions. Now on the one hand this means I’m never knowingly under catered, so if anyone was to stop by for dinner unannounced chances are there’d be plenty food for them and/or there is always leftovers to hand in the fridge or freezer. But equally this means I cannot cook for 1. No matter how hard I try I always end up cooking for at least 3 people: and that’s just my solitary suppers. Can you imagine when I cook for a crowd? A Sunday lunch for 5 at my house will quite happily feed my postcode. That all being said, I’m reluctant to apologise for this affliction. Yes I may overcook but I abhor food waste, and thankfully, I really do enjoy leftovers. I mean the sole reason I cook 3-4 times the amount of roast potatoes required is because I adore eating them cold. Now the downside to this is that you can end up eating the same meal for 4 days in a row. Which, when I was studying, I kinda liked. It removed the hassle of trying to figure out what to eat each night, and no doubt once the baby arrives I won’t care what I eat provided its handed to me, warmed up, in a bowl and accompanied with a spoon. However if you plan ahead, and stock up on the freezer bags or tupperware boxes, you’ll have a bunch of homemade dinners ready for you which only need heating up. I mean, anything which stops me reaching for a bag of crisps and a block of cheese for dinner after work is a winner in my book. All cards on the table, this curry will take approx. 30-40 minutes to make from scratch, which for most of us mid-week and/or after work is cause for a nervous breakdown. However if you make it in advance, you can keep it chilled in the fridge for a couple days or stash in the freezer for up to 2 months: then just reheat on the hob or in the microwave. I normally serve this with rice but you could warm up a few flat breads instead if the thought of cooking rice is too much to cope with. This will give you approx. 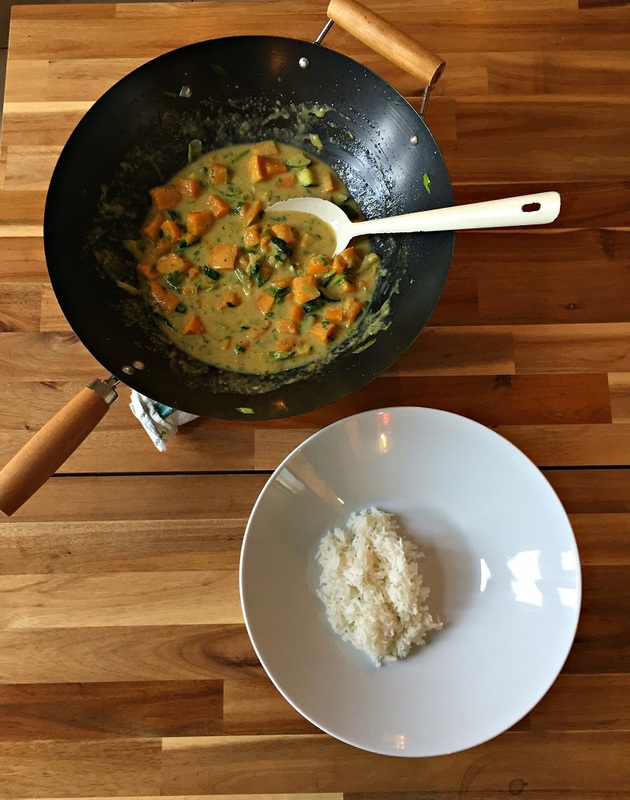 4 portions but this is entirely dependent on how much veg and coconut milk you use. So feel free to add more or less coconut milk & vegetables depending on how many portions you want. Likewise, you can chuck in any extra veg, meat or seafood you have lying around. I mean, this is just what I had in my fridge but I wouldn’t be adverse to adding either chicken, salmon chunks, tiger prawns, spinach, pak choi, baby corn etc, if at least to change it up from time to time. Make it Vegan: Most Thai green pastes are vegan, if you’re concerned then click here for a homemade version. Make it Gluten Free: In my experience most Thai pastes contain yeast extract. Click on the link above for a homemade version if you cant find a GF friendly one. Pre-heat the oven to 200C. 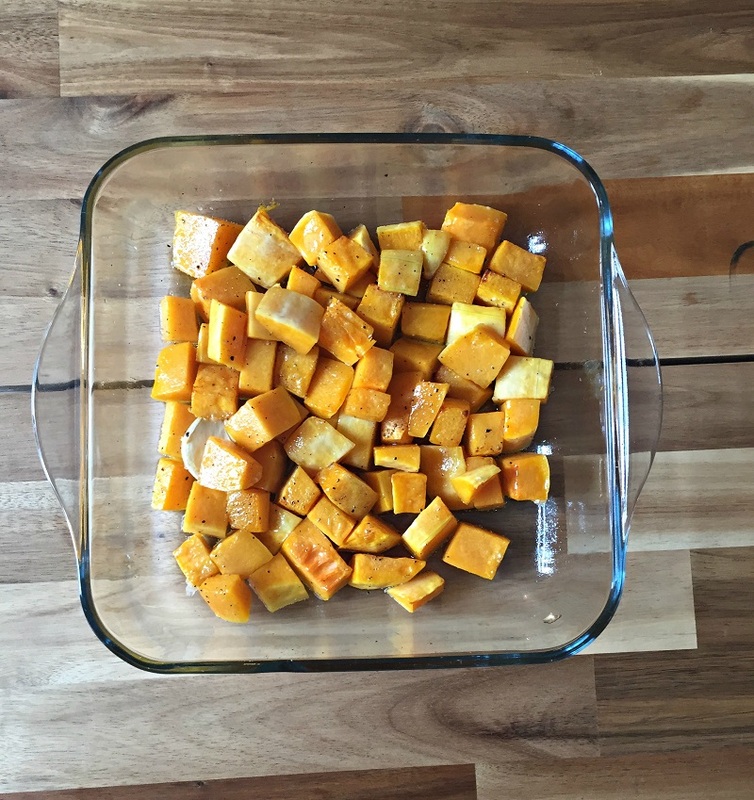 Peel the butternut squash, chop into bitesized chunks, and toss into a baking dish with a little oil & the unpeeled whole garlic clove. Roast the squash for approx. 15-20 minutes until softened. 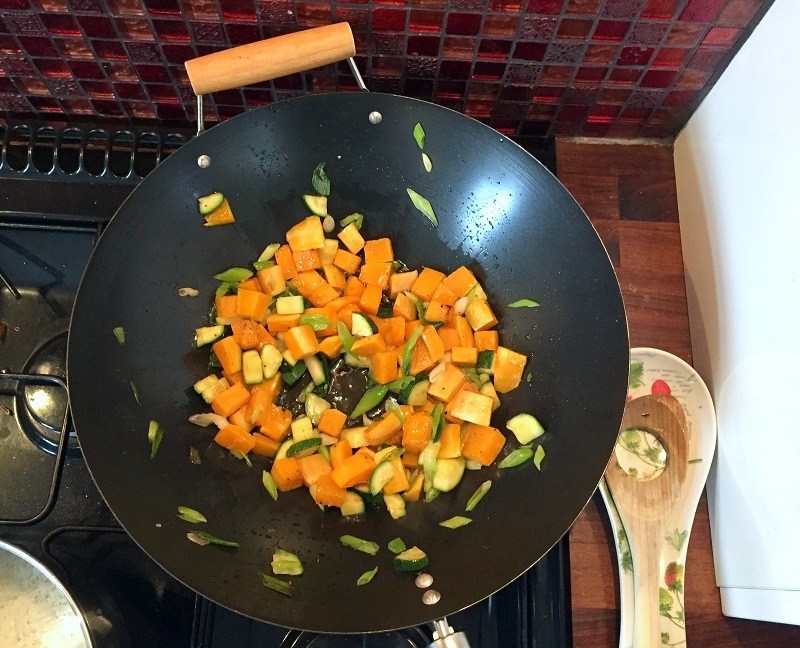 While the squash is cooking, prep your veg by cutting into bitesize chunks or thin slices. Heat a little olive oil in a wok over a high heat: toss in the courgettes & spring onions, and stir fry over a high heat for 3-5 minutes. Next add the butternut squash and Thai curry paste, and cook for a further 2-3 minutes. I normally add 2tbsp of curry paste for a medium level of heat but pastes can vary in heat so if you’re unsure then just add 1/2 – 1 tbsp. Then, once all the liquid has been added, you can taste and add more if you want. 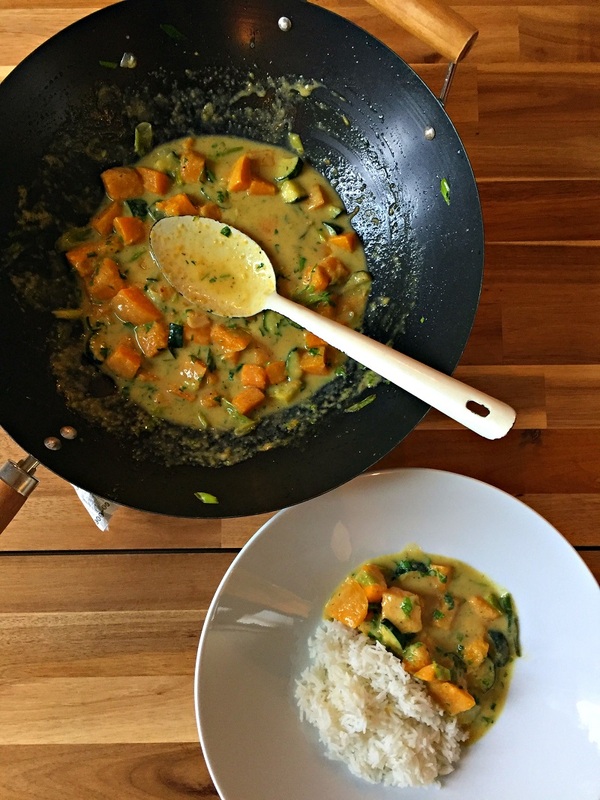 Scrape the thick creamy top of the tinned coconut milk into the pan and mix together with the vegetables to form a thick aromatic paste, then add the rest of the liquid from the can. Reduce the heat to a rapid simmer, partially cover with a lid, and cook for a further 5-10 minutes to thicken the sauce. When ready to serve, taste for seasoning, add the lime juice, and any additional curry paste or salt and pepper if you think it needs it. Stir in some chopped herbs if using. Serve immediately with boiled rice or flatbread.